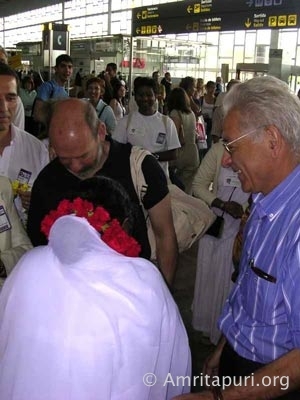 Amma bows down to everyone here, who are embodiments of pure love and the Supreme Consciousness. The effort and self-sacrifice of those who are capable of organizing such an enormous event is beyond words. 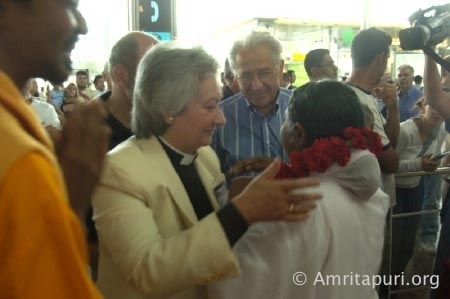 Amma simply bows down in front of such selflessness. Our God-given abilities are a treasure, meant for ourselves as well as for the entire world. This wealth should not be misused, creating a burden for us and for the world. The greatest tragedy in life is not death; the greatest tragedy takes place when our talents and capabilities are underutilized and allowed to rust while we are living. When we use the wealth obtained from nature, it diminishes; but when we use the wealth of our inner capabilities, it increases. But, are we using our abilities properly? What has always been the aim of humanity? Where has human society always yearned to reach? Has it not always been everyone’s goal to obtain as much happiness and contentment as possible in both our personal lives and in society? But where do we stand today? Most of us move from one mistake to another, which only makes our problems worse. Every country has tried increasing its power in politics, the military, weaponry, economics, science and technology. Is there anything we have yet to test and explore? We are all so focused on those areas. Having tried these methods for so long, have we achieved any real peace or contentment? No. Time has proven that these methods alone cannot secure us contentment. Only if spiritual power with which we have never before experimented grows alongside all those different areas, can we attain the peace and contentment we are seeking. In reality, there is only one difference between people in wealthy countries and poor countries: while people in wealthy countries are crying in air-conditioned rooms and palatial mansions, the people of poor countries are crying on the dirt floors of their huts. In any case, one thing is clear: people, who once hoped to smile and be happy, are now shedding tears in many parts of the world. Sorrow and suffering are becoming the hallmark of many countries. It is senseless to blame all this on religion alone. A major cause of these problems is the interpretation people have given to religion and spirituality. In short, today we search externally for the causes and solutions to all the problems of the world. In our haste, we forget the greatest truth of all that the source of all problems is to be found within the human mind. We forget that the world will become good only if the mind of the individual becomes good. So, along with an understanding of the outer world, it is essential that we also come to know the inner world. There was once a function to inaugurate a new supercomputer. After the inauguration, the participants were told that they could ask the supercomputer any question and it would come up with the answer in seconds. Everyone did their best to ask the computer the most complicated questions relating to science, history, geography, and so on. As soon as each question was posed, the answer would pop up on the screen. Then, a child stood up and asked the supercomputer a simple question: “Hello, Supercomputer. How are you today?” The screen remained blank for a long time and there was no response! The computer could come up with answers to questions about everything except itself. Most of us live in a state similar to that of the computer. Along with our understanding of the outside world, we should also develop our knowledge about our inner world. When our telephone is out of order, we call the telephone company to repair it; when our cable TV fails to receive programs clearly, the cable company helps us; and when our Internet connection is not working, the Internet company fixes it. In a similar way, spirituality is the means to restore our inner connection with the Divine. The science of spirituality puts the ëremote controlí of our mind back into our hands. There are two types of education: education for a living and education for life. When we study in college, striving to become a doctor, a lawyer, or an engineer ñ this is education for a living. On the other hand, education for life requires understanding the essential principles of spirituality. This means gaining a deeper understanding of the world, our minds, our emotions, and ourselves. We all know that the real goal of education is not to create people who can understand only the language of machines. The main purpose of education should be to impart a culture of the heart – culture based on spiritual values. Viewing religion externally creates more and more division. We need to see and understand the inside, the essence of religion, from a spiritual perspective. Only then will the feeling of division come to an end. Where there is division, there cannot be any real spiritual experience; and where there is true spiritual experience there will be no division, only unity and love. Religious leaders should be prepared to work on the basis of this knowledge, and make their followers aware of these truths. 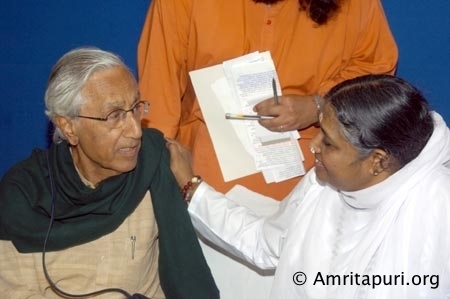 The problem arises when we say, “Our religion is right; yours is wrong.” This is like saying, “My mother is good; yours is a prostitute!” Love and compassion are the very essence of all religions. Where, then, is the need for us to compete unnecessarily? Love is our true essence. Love has no limitations of caste, religion, race, or nationality. We are all beads strung together on the same thread of love. To awaken this unity, and to spread to others the love that is our inherent nature, is the true goal of human life. Indeed, love is the only religion that can help humanity to rise to great and glorious heights. Love should be the one string on which all religions and philosophies are strung together. The beauty of society lies in the unity of hearts. There is much diversity in Sanatana Dharma, India’s ancient spiritual tradition. Every person is unique. Everyone has a different mental constitution. The seers provided us with a multitude of paths, so that each individual can choose the way most suitable for him or her. All locks cannot be opened with the same key, nor does everyone like the same type of food or clothing. This diversity holds equally true for spirituality, the same path will not be suitable for everyone. 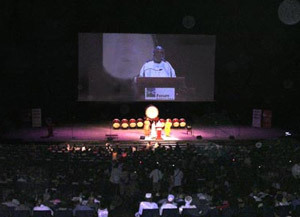 Meetings and conferences such as this need to place more emphasis on spirituality, the inner essence of religion. This is the only way to achieve peace and unity. This conference should not be just a meeting of bodies. On occasions such as this, a true meeting should take place, one in which we can see and know each other’s hearts. Communication through machines has even made people in far off places seem very close. Yet, in the absence of communication between hearts, even those who are physically close to us seem very far away. So, this should not be an ordinary conference, where everyone talks, nobody listens, and everyone disagrees. Listening to others is important. We may see and hear many things in the world. But we shouldn’t meddle in the affairs of others, because that can have dangerous consequences. 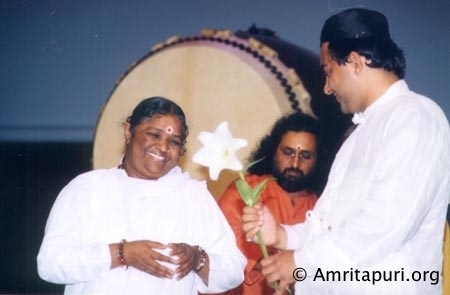 Amma remembers a story. A man once walked past a mental hospital and heard a voice moaning, “13…13…13…13…” The man went closer to locate where the sound was coming from. He saw a hole in the wall and realized that the sound was coming from the other side. Out of curiosity, he put his ear into the hole, hoping to hear better. Suddenly something bit him hard on the ear. As the man screamed in pain, the moaning voice groaned, “14…14…14…14.”! We should use our power of discrimination to distinguish between what we should or should not pay attention to. 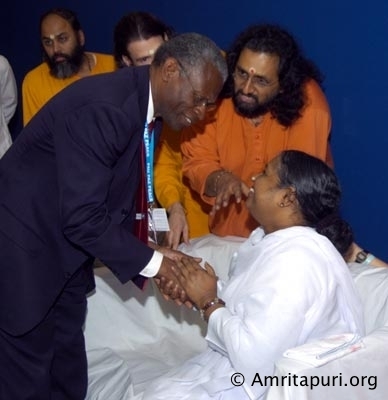 True religious leaders love and worship the whole Creation, seeing it as God Consciousness. They see the unity in diversity. But nowadays, many religious leaders misinterpret the words and experiences of the ancient Seers and Prophets, exploiting weak-minded people. Religion and spirituality are the keys to open our hearts and see everyone with compassion. But, blinded by our selfishness, our minds have lost their proper judgement and our vision has become distorted. This attitude will only serve to create more darkness. Using the same key meant to open our hearts, our indiscriminate mindset is locking it shut. There were once four men who had gone to attend a religious conference and had to pass the night together on an island. It was a bitter-cold night. Each traveler carried a matchbox and a small bundle of firewood in his pack ñ but each one thought that he was the only one who had firewood and matches. The last man thought, ìThis guy has a different skin color than mine, and I hate that! There’s no way Iím going to use my wood for him!” In the end, not one of them was willing to light his wood to warm the others, and so, by morning they all froze to death. Similarly, we quarrel in the name of religion, caste, nation, and color, without showing any compassion towards our fellow beings. Modern society is like a person suffering from a severe fever. As the fever increases, the patient says senseless things. Pointing at a chair on the floor, he may ask, “Why is that chair flying?” What answer can we give? How can we prove to him that the chair is not flying? There is only one way to help him: we have to give him medicine to bring down the fever. Once the fever is reduced, everything will return to normal. Today, people are suffering from the fever of selfishness, greed, unrestrained desire and so forth. Religion and spirituality form the path that helps transform the anger within us into compassion, our hatred into love, our lustful thoughts into divine thoughts, and our jealousy into sympathy. Yet, in our present deluded mental state, most of us do not understand this. Society is comprised of individuals. It is the conflict in the individual mind that manifests as war. When individuals change, society will automatically change. Just as hatred and vengefulness exist in the mind, peace and love can also exist in the mind. To wage wars, we spend billions of dollars and engage countless people. Think of how much attention and intense effort goes into that process! If we were to use even a fraction of this money and effort for the sake of world peace, we could definitely bring about peace and harmony in this world. Every country spends huge amounts on building security systems. Security is indispensable. But the greatest security of all is to absorb the spiritual principles and live accordingly. We have forgotten this. The enemies that are today attacking us from within and without cannot be dealt with just by increasing the strength of our weapons. We can no longer afford to delay the rediscovery and strengthening of our most powerful weapon, spirituality, which is inherent in us all. There are over a billion people in this world suffering from poverty and starvation. This, in truth, is our greatest enemy. Poverty is one of the basic reasons why people commit theft and murder, and become terrorists and prostitutes. Poverty not only affects the body, but also weakens the mind. Such minds are influenced in the name of religion and injected with the poison of terrorist ideals. Looking at it this way, Amma feels that 80% of the problems in society would be resolved if we were to eradicate poverty. We shouldnít become like this driver. We need a clear goal. 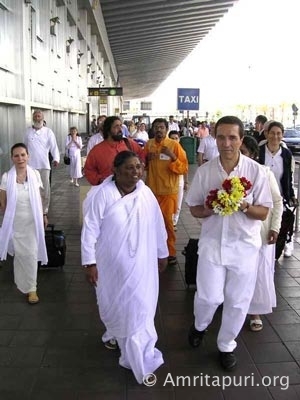 Amma is alarmed to see the direction in which the world is heading. If, in the future, there is a Third World War, let it not be a war between countries, but rather a war against our common enemy, poverty. In today’s world, people experience two types of poverty: The poverty caused by lack of food, clothing and shelter; and the poverty caused by lack of love and compassion. Of these two, the second type needs to be considered first ñ because, if we have love and compassion in our hearts, then we will wholeheartedly serve those who suffer from lack of food, clothing and shelter. It is not the era we live in, but the compassionate hearts that will bring about a change in society. Religions should be able to create more compassionate hearts. This should be the main objective of religion and spirituality. In order to protect this world, we have to choose a path forsaking our personal differences and desires. By forgiving and forgetting, we can try to recreate and give new life to this world. Digging up and scrutinizing the past is useless, and will benefit no one. Abandoning the path of vengeance and retaliation, we need to impartially judge the present situation in the world. Only then can we find the path to true progress. True unity ó both amongst humanity and between humanity and Natureówill come only through our faith in the immense power of the inner Self, which is beyond all external differences. A rainbow gives visual splendor and also has an inner significance that helps expand the mind. A rainbow is formed by the convergence of seven different colors, making it so attractive and beautiful. In a similar way, we should be able to recognize and accept the differences created by religion, nationality, language and culture. We should be able to join hands, giving primary importance to humanity and universal human values. A rainbow appears and disappears in the sky within a span of minutes. However, in that short lifespan, the rainbow is able to make everyone happy. Just like the rainbow, which appears small in the infinite sky, our lifespan, which appears for just a short while within the infinite span of time, is also very small and insignificant. As long as we live in this world, our greatest and foremost duty (or dharma) is to be of some benefit to others. Only when goodness awakens within the individual will one’s personality and actions gain beauty and strength. From then on, the little girl would sit by her window, waiting for the sun and the rain to come together. She no longer cared to watch the other children play. Finally, one bright, sunny day, it unexpectedly began to rain lightly, and the most heavenly-colored rainbow appeared in the sky. The little girl’s joy knew no bounds. She called out to her mother to come quickly and take her to the rainbow. Not wanting to disappoint her daughter, the mother helped her little girl into the car and drove off in the direction of the rainbow. Finally, when they arrived at a point where they had a good view of the rainbow, the mother stopped the car and helped her daughter to get out, so that she could enjoy the sight. Looking up at the rainbow, she asked, ìWondrous rainbow, how is it that you are able to shine so radiantly?î The rainbow replied, ìMy dear child, I have a very short lifespan. Only for a brief span of time while the sun and rain come together do I exist. Rather than fret over my short existence, I have decided that within my brief lifespan, I want to make as many people as I can as happy as possible. And when I decided to do that, I became radiant and beautiful.” Then, even as the rainbow was still speaking, it began to fadeóuntil, finally, it was no more. The little girl looked up with love and admiration at the spot in the blue sky where the rainbow had just been. From that day on, the little girl was never the same. Instead of moping and fretting about her disability, she tried to smile and bring happiness to everyone around her. Thus, she found true happiness and satisfaction in life. The rainbow was so beautiful because it forgot about itself and lived for the sake of others. Similarly, it is when we forget about ourselves and live for the happiness of others that we experience the real beauty of life. The body will perish whether we work or sit idle. Therefore, instead of rusting away without doing anything for society, it is better to wear oneself away in the pursuit of good actions. According to the scriptures of India, there is no difference between the Creator and creation, just as there is no difference between the ocean and its waves; the essence of both the ocean and the waves the are one and the same: it is water; gold and gold ornaments are the same because gold is the substance of the ornaments; and clay and the clay pot are ultimately one and the same because the component of the pot is clay. So there is no difference between the Creator or God, and the created, the world. Essentially they are one and the same ñ pure consciousness. So, we should learn to love everyone equally, because in essence we are all one, one Atman, one soul. Though externally everything looks different, internally all are manifestations of the absolute Self. God is not a limited individual, who sits alone up in the clouds on a golden throne. God is the pure Consciousness that dwells within everything. We need to understand this truth, and thereby learn to accept and to love everyone equally. Just as the sun doesn’t need the light of a candle, God doesnít need anything from us. God is the giver of everything. We should move amongst the suffering people and serve them. There are millions of refugees and destitute people in the world. Governments are trying to help such people in various ways, but the world needs far more people who are ready to work in a spirit of selflessness. At the hands of self-serving people, one million dollars becomes only 100,000 dollars by the time it reaches the people who should benefit from the funds. It is like pouring oil from one container into another and then another. After doing this many times, there is no oil left because some of it sticks to each container. But with those who are engaged in selfless service, it is quite different. Such people may receive only hundreds of thousands of dollars, but will deliver the equivalent of millions to people in need. This is because their motives are selfless; they simply desire to benefit society. Rather than take any pay for themselves, they donate it to those who are suffering. 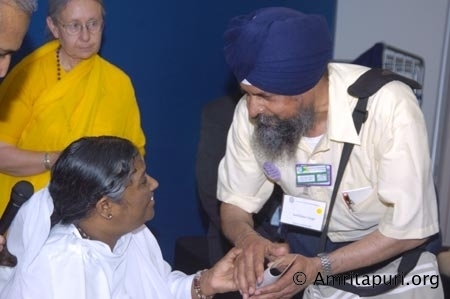 If we have at least a little compassion in our hearts, we should commit ourselves to working overtime an extra half hour a day for the sake of those who are suffering ñ this is Amma’s request. 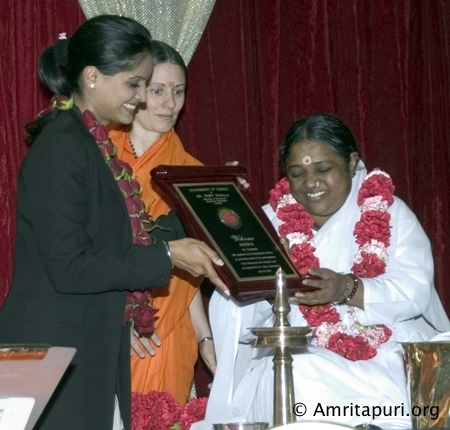 Amma believes that in this way a solution for all the sorrow and poverty in the world will be revealed. Today’s world needs people who express goodness in their words and deeds. If such noble role models set the example for their fellow beings, the darkness prevailing in today’s society will be dispelled, and the light of peace and non-violence will once again illumine this earth. Let us work together towards this goal. May the tree of our life be firmly rooted in the soil of love Let good deeds be the leaves on that tree; May words of kindness form its flowers; May peace be its fruits. Let us grow and unfold as one family, united in love ñ that we may rejoice and celebrate our oneness in a world where peace and contentment prevail. 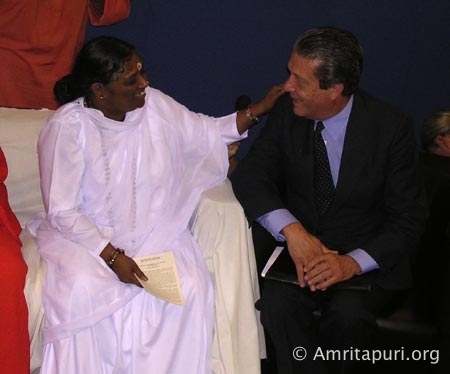 As Amma concludes Her words, She would also like to add that, in truth, nothing ends. Just like the period at the end of a sentence, there is only a short pause ó a pause before a new beginning on the path to peace. May divine Grace bless us with the strength to carry forth this message. Isn’t it their Karma to Suffer? Q: Which Path Should I Follow? Which is the Best Path for Westerners? 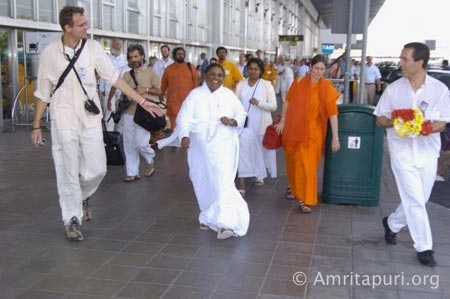 Amma: “Whether it is in the East or in the West, one’s spiritual path can only be indicated according to one’s inherited spiritual disposition and mental constitution. One path cannot be announced in a public address as the one and only path for all. The advice given is particular to the individual. Each person is a patient with a different disease. Some people are in the beginning stages of a disease while others are in the middle stages. In addition, we find people with chronic diseases and still others who are half-cured. Therefore, the treatment for each person cannot be the same. The medicine will be different and the dosage will vary. But generally speaking, the path of devotion is the easiest and least complicated. While anybody can love, not all can do pranayama (breath control) or hatha yoga (yogic postures). Only certain people endowed with a certain mental and physical constitution can do these. But love has no prerequisites. Whoever has a heart can love, and everyone has a heart. To love is an innate tendency in human beings. “The path of love, otherwise known as the path of devotion, is the best path for Western children. Of course, this is a general statement. In the West, society is such that people, even from early childhood, are intellectual and take an intellectual approach to everything. It is the product of their ‘modern’ education. They are fed with all kinds of factual information about the empirical world, and the emphasis is on science and technology. So their analytical minds are well developed, but their hearts are dry. In most cases, the hearts of people in the West remain underdeveloped and imperfect. The head is big, but the heart is shrivelled up and dry. Which is Superior, Bhakti or Karma Yoga? 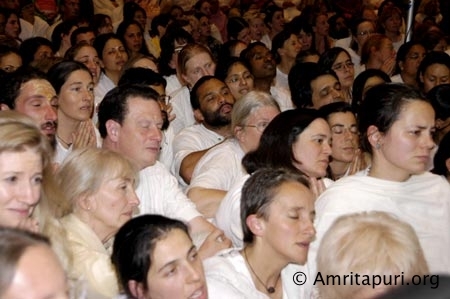 Why does Amma place so much importance of the path of devotion? “There are many reasons why we should consider the path of devotion the most suitable path for most people. First of all, it gives much contentment to the practitioner. A contented person will have enthusiasm and vigour. Such a person will be very optimistic and endowed with an adventurous mind. Their attitude is that life and everything that happens in life is a gift, and this gives them immense patience and strength. Unlike those who pursue other paths, such a one does not believe that happiness is a right to which he or she is entitled. As far as they are concerned, there are no rights, there are only gifts. This attitude helps them to accept everything as a gift, both good and bad, and also instils them with courage and faith. Such a person will have a loving and compassionate heart, a childlike innocence and a pleasing nature. Not wanting to injure anyone or hurt anybody’s feelings, he or she cannot harm anyone. They will also have the power to renounce comforts and pleasures for the happiness and peace of others. He or she will experience the same problems in life as everyone else, but he will have the mental ability and balance to remain calm and quiet when adversity arises. He or she practices acceptance, for such a one’s attitude is that life and everything that happens in life is a gift, not a right. 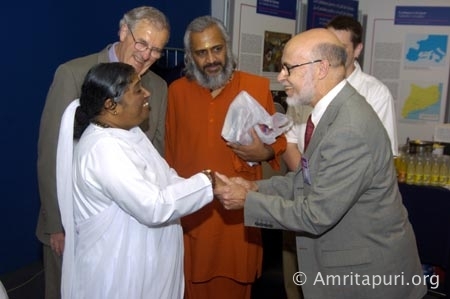 Amma: “What Mother would like to say is that names and forms are needed for people like us with the kind of mental calibre that exists today. It will help our spiritual growth. Do not say that ours is the best path and all other paths are wrong. If a person’s choice is tea, have it, fine and good. Let those who do not like tea drink coffee, lemonade or plain water. Why should we bother our heads about people’s personal preferences? Why should we say that tea alone is good and all other drinks, bad? The purpose is to quench the thirst. Therefore, whether it is meditation on the Supreme with attributes or the Supreme without attributes, the goal is to attain perfect mental peace in any circumstance. Give up all such doubts about gods and goddesses and do your sadhana. “Look children, Amma knows very well that all names and forms are limited and that God is nameless, formless and attributeless. Still, the sweet and blissful feeling that one gains from singing the glories of the Lord is an incomparable and inexpressible experience. “All the names and forms, whatever they are, are only creations of the mind for one who has gone beyond the mind. But this is not the case for one who has not reached the state of perfection. He or she may say that all names and forms are unreal and that Brahman alone is true and real. However, if they have not experienced perfection, it is meaningless to go around declaring the unreality of forms. “Everything is Brahman, that is right. But have you realised That? It is like a blind person saying that there is light everywhere. Why do you talk unnecessarily about some thing that you have no idea about at all? You constantly experience the world and its objects, but you talk about something which you have never experienced. “When we worship Rama, Krishna or Christ, we adore the eternal ideals which manifest through Them. If they were mere individuals, nobody would have worshipped Them. When they are worshipped, a true seeker is not adoring a limited individual but the same all-pervading cosmic intelligence which you believe is the only Truth. 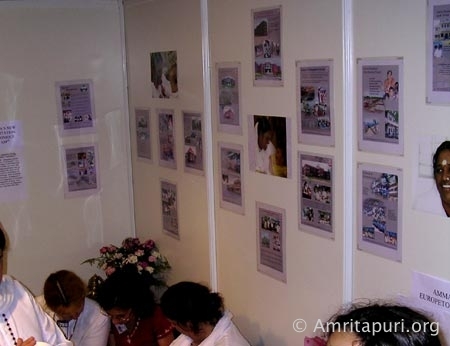 A state-of-the-art E-learning Studio with 6 simultaneous synchronous LCD panels was launched at Amrita Vishwa Vidyapeetham (Amrita University) Ettimadai campus on 7 July, 2004 by Mr. Kris Gopalakrishnan, Co-founder and Chief Operating Officer of the Indian IT major, Infosys Technologies. Mr. Bhaskar Narayan, Director, Satellite Communications, Indian Space Research Organization (ISRO) was the distinguished guest of honour for the function. This studio and e-classroom is the front-end of the high bandwidth satellite network, which has made Amrita University a fully interactive, multimedia capable, multi-disciplinary virtual university – the first of its kind in the nation. It will enable interactive class room sessions across all 4 campuses of the University. The teacher is empowered with the unique capability of performing two-way live audio-video interaction. The facility is equipped with 130 seats for classroom instruction, 24 hours a day, 7 days a week using the dedicated satellite link with a bandwidth of 1.5 Mbps. The e-classroom is ergonomically designed so as to enhance the teaching and learning process and give teachers and students a feel of a normal class room session. This heralds a new vista in the delivery of education and is a model for educational institutions across the country. Amrita University has plans of immediately offering various courses between campuses. Courses on cutting-edge technology areas like Mobile and Wireless communication, Information Security, VLSI using Cadence tools, Bioinformatics etc. With ISRO, Amrita University plans to start Village Resource Centers for the transformation of rural communities. 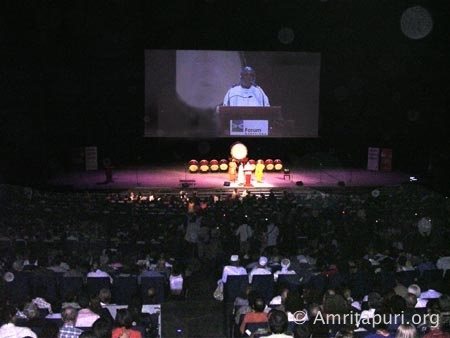 “This is the highpoint of Amma’s tour. 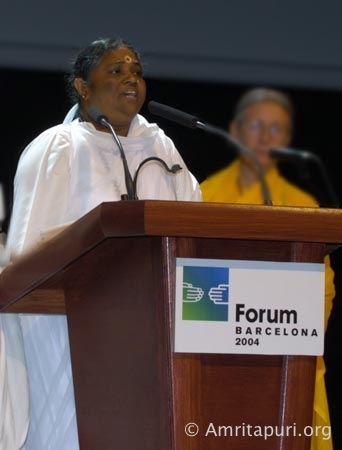 It’s all down hill from here,” joked one of Amma’s devotees from Santa Fe. 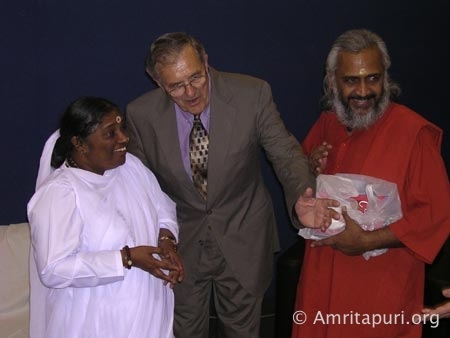 He was referring to the fact that, at 7,000 feet above sea level, Amma’s programmes at Her New Mexico ashram are the most physically elevated of Her U.S. Tour. The two days Amma spent at the ashram were blissful ones—both for the devotees and for the land. 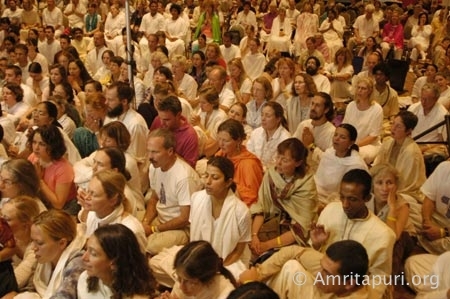 The ashram is located in one of the most arid areas of the United States and, as is typical in the summer, Sante Fe was undergoing a severe drought. Many of the shrubs around the ashram property were starting to die from lack of water and ground wells were running very low. But, as always, Amma’s presence seemed to bring the rain. Each day Amma was in Santa Fe, it poured down. “It always happens in Santa Fe. 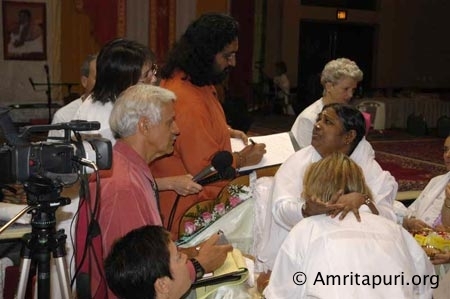 After a long drought it rains when Amma arrives,” says Steve, a resident of the ashram. 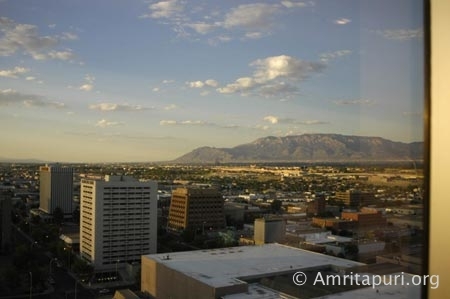 As New Mexico is home to a great number of people who speak Spanish, each night Amma sang bhajans in that language, including “Ishwar Tumhi” and “Anantamami.” She also sang in English and in Hebrew. 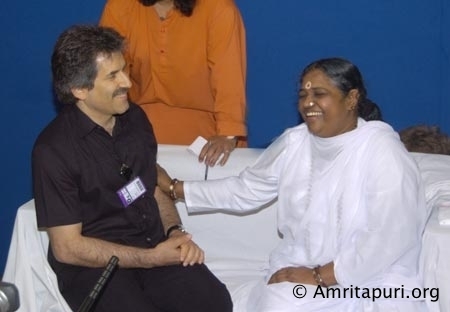 When one man from Lebanon came for Amma’s darshan, She stopped everything and, with him laying across Her lap, sang “Ishwar Tumhi” in Arabic in its entirety. The man seemed unable to believe what was happening to him and, by the time Amma finished, nearly five minutes later, he was crying uncontrollably. 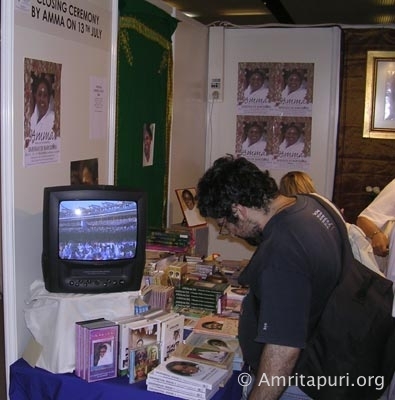 As in India, extended Latin American families are very close and, more than once, Amma gave darshan to groups of as many as 16 people. 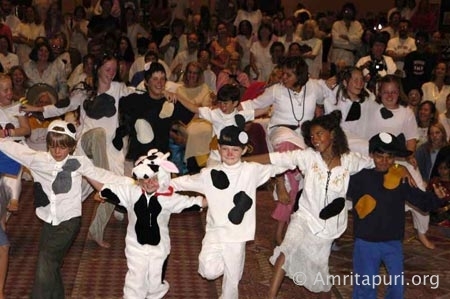 Another extended family came to see Amma in New Mexico as well—the Tewa Dancers, Native American Pueblo Indians who represented the indigenous people of North America during Amritavarsham50. The Tewa Dancers came to offer another dance performance for Amma, but Amma had a surprise in store for them—during Her bhajans on the night they were present, She sang “Ishwar Tumhi” in their own native Tewa tongue. 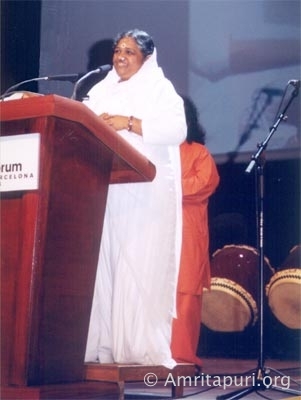 The applause following Amma’s song was far louder than could have come from the group of 10 Tewa speakers there. Later on, the Tewa Dancers performed several traditional dances, including the Deer Dance, which they explained could not be performed in India because they could not fit the antlers on the plane. Later on Devi Bhava, Amma married two of the dancers, who were dressed in the traditional Tewa marriage dress. 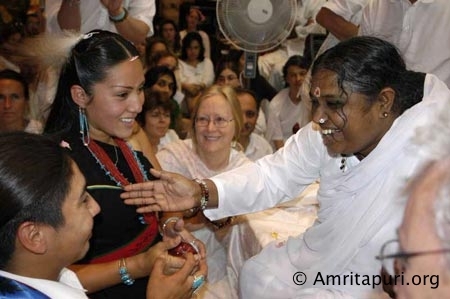 Although Albuquerque is 2,000 feet below Santa Fe, Amma’s programmes there seemed even more elevated than the ones at the ashram, as Amma’s children were given a double blessing—hearing Amma sing Sri Adi Shankaracharya’s “Mahishasura Mardini” on July 1st and being able to celebrate Guru Purnima in the physical presence of their Guru on the 2nd. 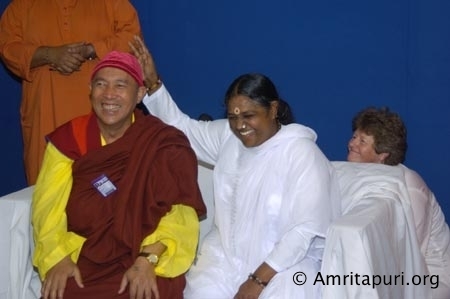 Rumors had been spreading in Los Angeles that Amma would soon sing Shankara’s stottram, but it did not materialise in L.A.. 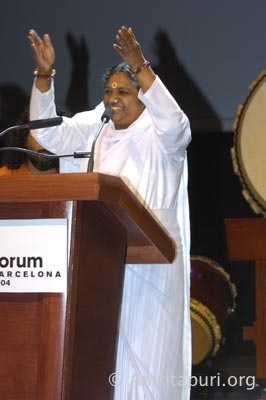 But then at the end of bhajans on the first night of the Albuquerque retreat, devotees were thrilled to hear Amma ecstatically calling out, “Jay jaya he mahishasura mardini ramya kapardini shailasute!” over and over again. 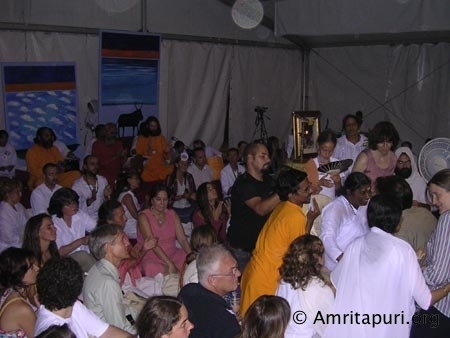 Each time one thought the ancient chant in praise of Devi was coming to an end, Amma would keep it going, chanting on and on at a faster and faster tempo. By its end everyone was all but out of breath. 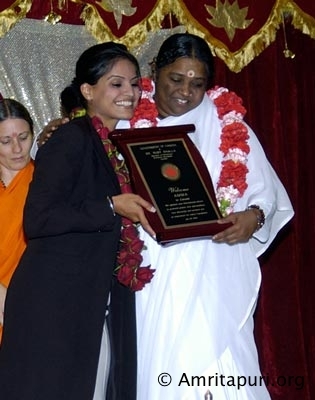 As Amma ended darshan on the 2nd, Swami Amritaswarupananda delivered a Guru Purnima message, saying how, for a true disciple, worship of the Guru’s feet is not a once-a-year-affair, but his or her entire life. 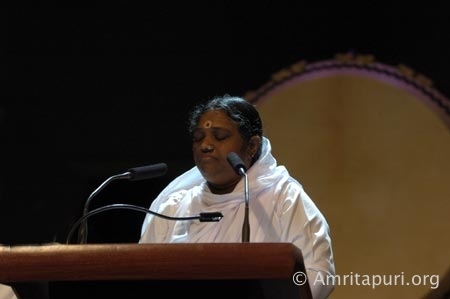 Upon darshan’s conclusion, Amma delivered a Guru Purnima message to Her children, leading them in several minutes of chanting the peace mantra “Om lokah samastah sukhino bhavantu”. 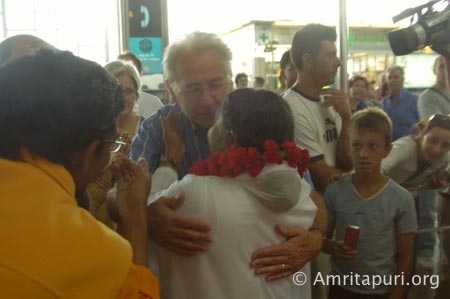 Amma asked everyone to imagine their prayers as spreading out to cover the entire world and, in particular, asked them to think of all of Her children unable to be in Her physical presence at that hollowed moment. 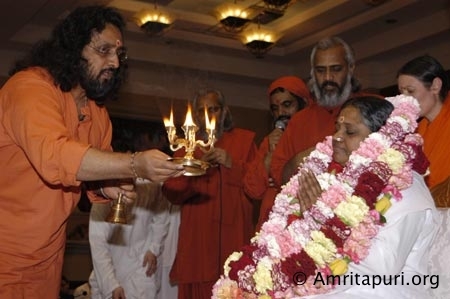 Swamiji then performed Amma’s padapuja, leading the chanting of Amma’s 108 names. Upon the puja’s conclusion, he and all of Amma’s sannyasins garlanded Amma until She was practically buried in flowers. Guru Stottram and “Satguruve Jaya” were also sung. Then Amma distributed payassam to all the devotees. It was past 3:30 when She finally left. It was Guru Purnima and Amma had spent the whole day—as She does every day—giving everything to Her children. 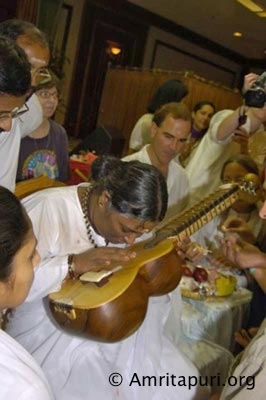 In all, some devotees had Amma’s prasad four times that day: the dinner Amma served at the retreat, a Hershey’s Kiss from their darshan, Amma’s payassam and then the mahaprasad of Amma’s padapuja.